Home Retail Industry Many Say the Brick-and-Mortar Retail Industry Is Dying. Here’s Why They’re Wrong. Over the years, retail has been in a constant state of change and disruption. What is an industry disruption? Think Uber. The taxicab industry will never be the same. Retail has seen its fair share of disrupters. Everyone talks about e-commerce, the internet and Amazon. Disrupters for sure. But disrupters in the retail industry go much further back than that. At the turn of the 20th century, major retailers usually had a single flagship store in the downtown section of a large city. Customers came by subway or trolley car. As the automobile flourished in the 1950s, suburban stores began to pop up in the surrounding areas. Then came big-box stores and “category killers.’ An early example of this is Barnes & Noble. Founded in 1917, Barnes & Noble took control of the retail side of the publishing industry and stayed on top until competitors such as Borders and Amazon showed up. But they didn’t come onto the scene until the 1970s and 1990s, respectively. Barnes & Noble may not be the powerhouse it once was, but it’s still around. Then there was the proliferation of the big-box disrupters such as Walmart, Target, Home Depot, Best Buy and others. Was retail dying? No, it was changing and adapting. It is true that many major retailers are actively closing stores throughout the United States. According to Business Insider, that number will be in excess of 3,800 in 2018. (Check out the useful chart they created to illustrate store closures in 2018). So, who will those “brave and wise” retailers be? As far as brick-and-mortar retail goes, it will be the ones able to distinguish their stores from online competitors. The same thing applies to mall operators. Most industry experts agree that the United States is “over-stored.” But store closures and rightsizing are only part of the solution. The real key for brick and mortar merchants and mall operators is to remain relevant as retail evolves and deliver new, interactive and exciting experiences to their customers. Customers have many choices today. Enhancing their experience while shopping is becoming a key competitive advantage. It’s true that big-box retailers originally won with selection, but as the selection and square footage that went with it grew, the interaction with the customer and their overall experience suffered. Smart retailers and mall operators are re-discovering that a “small-store feeling” and the value of the intimate customer relationship that goes with it is a key, going forward. Store design and mall content are critical factors in creating these new experiences. To that end, tenant mix in existing malls is changing. To maximize the use of existing square footage, some malls are being converted to include hotels, entertainment, medical facilities, corporate offices, gyms and even residential units. Meanwhile, smart retailers are working hard to improve their customers’ experience. 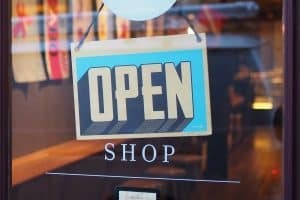 E-commerce gets a lot of attention in the retail world, but 85 percent of all retail activity still occurs in a store setting. Change and innovation on the part of brick and mortar retailers and mall operators is the key to the successful future of retail. And it’s far from dead!